Constructed of a proprietary polymer, these durable magazines fit 9mm Glock® handguns, including Gen 4 models. Reinforced feed lips, a stainless steel spring and a high visibility anti-tilt follower ensure reliable feeding. Pushbutton release on the floorplate allows the magazine to be easily disassembled without tools. Floorplate also has a pen dot matrix on the bottom for marking and identifying magazines. The GL9 consistently drops clear and free when released; loaded or empty. 17 GL9 fits flush at the base of the Glock® 17 grip, with some minor protrusion on compact and subcompact models. 15 GL9 fits flush on Glock®19, with some protrustion on subcompact pistols. SPECS: Fits - Glock full-size 9mm handguns, as well as compact and sub-compact variants. Capacity - 17 rounds. Construction - Polymer. I bought two of these because they are significantly cheaper than factory mags. I put hundreds of rounds through them ,and they function flawlessly. My only gripe is that the last round is tough to get in the mag. The great value allows me to purchase two mags for the price of one. No chambering or feed issues thus far, they lock securely into the mag well and drop free with no problem. The flared and ridged floor plates are a plus and they are easier to disassemble than the factory mags. They don't have the the individual windows from rounds 4-17 like the factory mags do but there are cuts on each side to show your 17th round but I never looked at those windows anyway. If you are looking to save weight they are an ounce lighter than the factory mags. You also can't beat the price for these. I have had almost no problems with any of the MAGPUL magazines I have purchased. As a novice shooter this product is easy to maintain and the only problem I've encountered is loading the 17th round. They feed the rounds flawlessly in my Glock 17. Bought two of these just to try out, Price was two for one for a Factory Mag, Have put hundreds of rounds through them with no feed issues what so ever. Drop free and actually feel a little lighter than Factory Mags. Bought the 3 pack for my Polymer 80 Glock 17 Gen 3 clone. Load'em, Slap'em in and your ready to fire. Slide locks open without a problem on last cartridge ejected. Magazines eject easily and without any hang or sticking. 17 round magazines are easy to disassemble also. So far, no problems with feeding or ejecting cartridges from the firearm. These do not have metallic lips or holes down the back. There is a hole at the bottom to indicate the 17th cartridge is loaded. I find them to be reliable and will probably purchase these again in the near future. These are great and dependable magazines. I have used these in both my 17's and 19's and they function flawlessly. These are mags you can depend on. I do. I got these delivered on 10/6/16 and I was signed up for a 2 day tactical course on 10/8/16 at Shaw Shooting here in Idaho. I put almost 900 rounds through 6 magazines in two days with no issues. I've done about 200 tactical reloads where the mag drops to the ground from a standing position and never once had an issue firing them. They're not as fancy as the Glock factory ones but are just as good or better. They don't have numbers to tell you how many rounds are left but if you use those you really need to shoot more and get to know the feel of your weapon. The only complaint I have which is minor is that the Magpul ones have very little metal inside them, which helps them weigh less. But this is an issue cause I use magnets to hold my magazines in place on my wall by my bed side. A year ago I purchased a different brand of magazine, clear in color to be exact. I had to grind on them as they stuck in my Glock, Since then, have been very skeptical about magazines. Decided to try this brand, am very impressed as they work comparable to the Glock brand. Have loaded at least 100 rounds per mag, no issues and they eject. The orange follower is a plus as can distinguish them from the Glock brand. I would buy these again and with the Brownell's guarantee, can't go wrong. I highly recommend!!!! LEO use. no feed/function problems, but a problem w/ failure to drop free with 3 of 6 mags, in 4 G17s. dyekem friction tests showed several high spots that had to be polished even then, mags would snag 1/3-1/2 way out. recommend for non-combat roles. Will save for OEM future mag buys. These are best suited for a trip to the garbage can.... JUNK!!! Purchased ten of these, and between myself and two other shooters, put hundreds of rounds through them with perfect function. If you've ever cursed and squeezed and hammered on the stock mags to get the baseplate open, you will LOVE the easy disassembly, using just the tip of a pen or 5.56 round. Having owned several AR-15 PMags, along with many other Magpul products, and been extremely pleased with those, I was quite excited for these. Have put nearly 500 rounds each through the two I bought without a single hiccup. Ran them through my G17 and G26, no issues whatsoever in either gun. Stupid simple to disassemble, much better over a traditional Glock mag. Typical Magpul quality and performance; for cheaper than a standard Glock magazine. I didn't order enough the first time around! Functions perfectly, no frills. $10 less than a factory magazine. Not metal lined, but falls free empty or full. You can never have too many mags. I bought a few of these trying to save a few dollars but when they arrived I quickly realized they would not fit my Dawson mag extensions that I use for competition. Since the mag extensions cost more then the mags I sent the mags back and purchased factory mags. If you are just looking for some good cheap mags, because you can never have too many, then these are the way to go. If you are looking for mags for competition I wouldn't recommend them. They might fit other extensions but the way the bases fit to the mag body is different then OEM. I ordered these because of the price and Magpie's reputation. While perfectly good magazines, I was a bit disappointed that they weren't as good as factory Glock magazines. However, you can never have too many magazines, and I will keep these and eventually also get Glock versions. For $10 less per mag, it's hard NOT to like these. Bought 4 of these. Difficult to load the last 2 rounds due to spring tension but that same tension assures the mag feeds properly. Drops free either empty or loaded. No failures of any kind. I will buy more when needed! I purchased 6 of these magazines to test out. Initially I was impressed with them as I have been a longtime Magpul PMag user. I took them to the range and fired rounds through them with no failures. After confirming that they were working, I loaded them up and took them with me to a week long CQB school I was attending. That's when I started having problems. When the gun heated up, I started suffering from failure to feeds. After conducting seven immediate actions to clear malfunctions, I switched to my OEM Glock mags that I had on my belt. The FTF disappeared. I went through several iterations switching from Magpul mag to Magpul mag. Every single time, when the gun started heating up from sustained fire, I started suffering FTF. Every time I switched over to OEM mags, the issue disappeared. I wasn't ready to give up on the mags just yet and decided to switch to a Glock 19. The first two mags I went through with my OEM Glock 17 mags to confirm they were working and I suffered no issues. When I switched over to Magpul mags, initially they worked fine. Once I went through the first mag and did a reload, I suffered a FTF after the third round. I did immediate action, cleared it and began firing. I suffered two more malfunctions on the next mag when I switched. After that, I ditched the mags for the rest of the week and stuck to my OEM magazines. Thankfully, Brownells offers a 100% satisfaction guarantee and I was able to return all my magazines for a refund. I hope that Magpul takes a look at their design and figure out a fix. These mags would be fine for some recreation range time if you're looking for cheap mags but for duty use, no. Received a pack of three mags today and went straight to my local range. After putting about 350 rounds through not on problem so far. The best price for made in the USA mags I could find for my weekly trips to the range. Used in polymer80 build and fully loaded factory mags were tight at first. All Pmags I bought 17 and 21 round dropped free and fed and fired perfectly. Will buy these again. Also fired them in a duty carry Glock 17 and worked perfectly. Great buy when on sale!!! 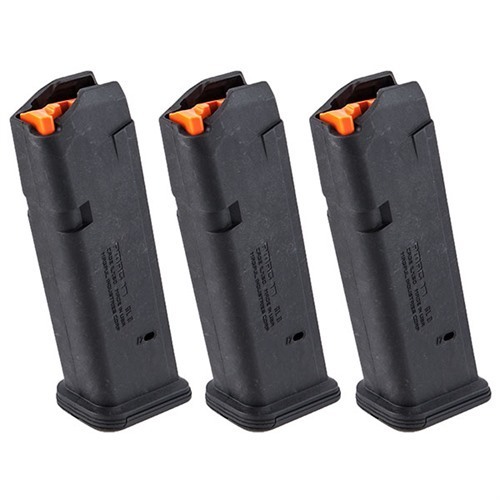 PMAG 17 GL9 Magazine 3 Pack for Glock® 17 Vyrobené z proprietární polymeru, tyto odolné časopisy vejde 9mm Glock® zbraně, včetně modelů Gen 4. Zesílené krmivového rty, pružina z nerezové oceli a vysokou viditelnost proti naklonění následovník zajišťují spolehlivé podávání. Tlačítko uvolnění na floorplate umožňuje časopis snadno demontovat bez použití nářadí. Floorplate má také jehličkové pera na spodní části pro označování a identifikaci časopisy. GL9 důsledně kapky jasné a zdarma při uvolnění; načten nebo prázdný. 17 GL9 se hodí flush na úpatí Glock® 17 grip, s některé menší výstupek na kompaktní a subkompaktní modely. 15 GL9 vejde zarovnané na Glock® 19, s nějakou protrustion na subkompaktní pistole. Zašleme e-mail na adresu , jakmile bude produkt PMAG 17 GL9 Magazine 3 Pack for Glock® 17 dostupný. Číslo výrobce: MAG546BLK 873750004495 Vyrobené z proprietární polymeru, tyto odolné časopisy vejde 9mm Glock® zbraně, včetně modelů Gen 4. Zesílené krmivového rty, pružina z nerezové oceli a vysokou viditelnost proti naklonění následovník zajišťují spolehlivé podávání. Tlačítko uvolnění na floorplate umožňuje časopis snadno demontovat bez použití nářadí. Floorplate má také jehličkové pera na spodní části pro označování a identifikaci časopisy. GL9 důsledně kapky jasné a zdarma při uvolnění; načten nebo prázdný. 17 GL9 se hodí flush na úpatí Glock® 17 grip, s některé menší výstupek na kompaktní a subkompaktní modely. 15 GL9 vejde zarovnané na Glock® 19, s nějakou protrustion na subkompaktní pistole.